Sweden doesn't get that Mideast relations 'are a lot more complex than the self-assembly furniture of IKEA,' quips Israeli foreign minister. 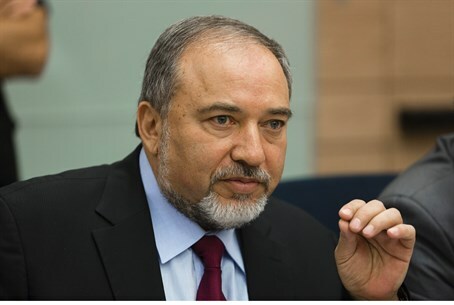 Israeli Foreign Minister Avigdor Liberman denounced the Swedish government's official recognition of a "Palestinian state" as "deplorable" Thursday, saying it would undermine efforts to resolve the conflict. "The decision of the Swedish government to recognize a Palestinian state is a deplorable decision which only strengthens extremist elements and Palestinian rejectionism," Israel's top diplomat said in a statement. In a dig at Stockholm's left-wing government, he added: "The Swedish government must understand that relations in the Middle East are a lot more complex than the self-assembly furniture of IKEA and that they have to act with responsibility and sensitivity." Earlier, Liberman's Swedish counterpart Margot Wallstrom told the Dagens Nyheter paper: "Today the government takes the decision to recognize the state of Palestine." He added that "the government considers that international law criteria for recognition of a Palestinian state have been fulfilled." he move came after recently-elected Prime Minister Stefan Loefven announced in early October that his country would become the first EU member-state in western Europe to recognize "Palestine", in his inaugural address to parliament. The Palestinian Authority immediately hailed Thursday's developments. "President [Mahmoud] Abbas welcomes Sweden's decision," spokesman Nabil Abu Rudeina told AFP, saying the Palestinian leader described the move as "brave and historic." "This decision comes as a response to Israeli measures in Jerusalem," he said. Abbas called for other countries to follow Sweden's lead. "All countries of the world that are still hesitant to recognize our right to an independent Palestinian state based on 1967 borders, with east Jerusalem as its capital, (should) follow Sweden's lead," his spokesman quoted him as saying. Israel has long insisted that the Palestinians can only receive a state through direct negotiations and not through other diplomatic channels. Seven EU members in eastern European and the Mediterranean have already recognized a Palestinian state - Bulgaria, Cyprus, the Czech Republic, Hungary, Malta, Poland and Romania. Non-EU member Iceland is the only other western European nation to have done so.